Delta Force Paintball is known for it’s incredible movie-set game scenarios, world-class facilities and state-of-the-art equipment. Our professionalism, quality zones and 100% safety record have put us at the forefront of the paintball industry. So as Australia’s premier provider of paintball games, it’s no surprise that we get a lot of celebrity visits. Over the years we have hosted paintball events for a large number of celebrities, including sporting icons, movie stars, musicians and politicians. 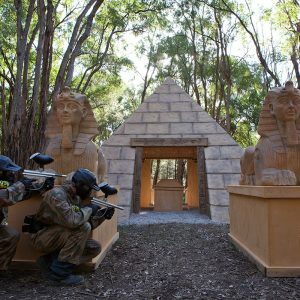 Delta Force Appin, located less than an hour from the CBD, is getting used to celebrity visits after recently entertaining Luke Jacobz – a viewer favourite on Home and Away and the host of various hit shows including Beauty and the Geek and the X Factor, the Parramatta Eels and Adam Liaw, winner of the hit 2010 Master Chef show. After winning the second series of Master Chef, Adam has written his own cookbook (Two Asian Kitchens) and is set to open a restaurant in Sydney. Adam and his friends enjoyed an action-packed day of paintballing at the best paintball centre in Sydney, Delta Force Appin. Our world-class facilities and professional staff made sure that Adam, along with all customers that came through the door, had a brilliant day. Manager Chris said that Adam’s paintballing was not as good as his cooking skills, but he definitely has a good eye for the game. 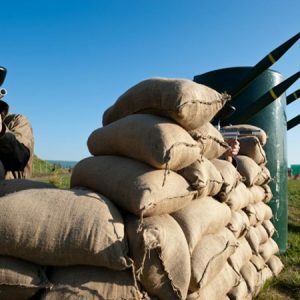 In Delta Force’s twenty-two year history we have hosted paintball games for all manner of celebrities, including the McLaren Formula One team, Elle MacPherson, Wayne Rooney as well as members of the British royal family. At Delta Force we make it our mission to extend the ‘celebrity-treatment’ to all our guests. We appreciate that you have a choice, and we are very grateful when you make the choice to play paintball with Delta Force! On a full day out at Delta Force you will receive top of the range safety equipment, ensuring your day of adrenalin-fuelled paintballing is more safe and comfortable than ever before. 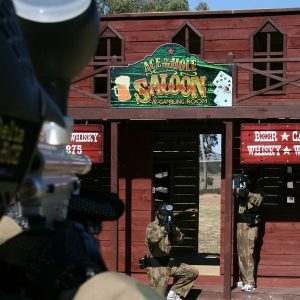 If you would like to play paintball with Delta Force and experience the celebrity treatment that we extend to each and every one of our customers, round up the troops and contact us today on 1300 850 744.